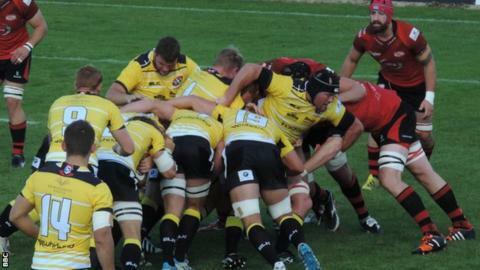 Jersey secured their first win of the new Championship campaign, narrowly overcoming Cornish Pirates 17-15 at St Peter. Two James Freeman tries, both from driving mauls, sent the islanders on their way but Alex Cheesman's score before half-time reduced the deficit to 12-7. Cheesman's second, three minutes after the restart, pulled the Pirates level. But Jersey centre Lewis Robling's well-worked try gave the hosts the win. Jersey have beaten Cornish Pirates by two points in each of their last three Championship clashes at St Peter, 27-25, 28-26 and now 17-15. The Pirates suffered their first set back in the opening seconds of the game, when skipper Chris Morgan had to come off with what looked to be an arm injury. Jersey were soon ahead, when flanker Freeman was driven over the line on six minutes. His second, 20 minutes later, was almost a carbon copy as he crashed over from another maul. The Pirates came more and more into it, with back row Cheesman driven over for tries three minutes either side of half-time to haul his side level at 12-12. Six days earlier Jersey had let slip a 13-point advantage in a 39-22 loss against Yorkshire Carnegie, and some home supporters must have feared a repeat. On the hour mark though Jersey were back ahead after fly-half Brendan Cope spotted a gap and neat handling saw centre Robling steal in for his first try of the new campaign. At the other end Kieran Hallett's long-range penalty narrowed the gap to two points but it was not enough to stop the islanders from taking another home win over the side from Penzance.